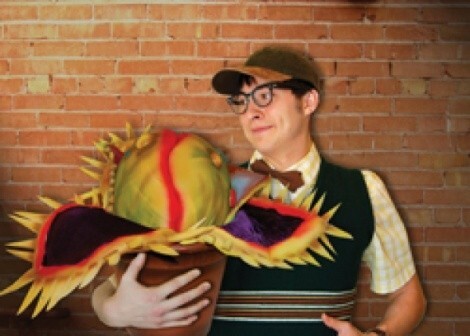 Energetic performances help Little Shop of Horrors break free of its confines. There’s something almost deliciously ironic about Park City’s Egyptian Theatre—smack in the middle of a ZIP code where the property is worth more than the gross national product of the European Union—trying to pass itself off as a “skid row.” But never let it be said that the Egyptian Theatre Company doesn’t know how to get into the spirit of a production: They’ve put together a skid-row set for Little Shop of Horrors that appears to be as close to imminent collapse as any building in the type of neighborhood it’s simulating. Other writers have dutifully noted of this production that ETC’s Little Shop was brought to fruition during the period between artistic directors, suggesting that any shortcomings could be traced to this leadership vacuum. Yet, what drawbacks there are to this generally satisfying production seem endemic to setting this particular show in this particular venue. Audrey II—the man-eating plant at the show’s center—is huge. The Egyptian Theatre stage is not. The math isn’t complicated. Nor is the show itself. Based on the 1960 Roger Corman film, the musical version by lyricist Howard Ashman and composer Alan Menken—who would later go on to become Disney’s house team for The Little Mermaid, Beauty and the Beast and Aladdin—keeps to its B-movie roots in its story of a nebbishy florist named Seymour (J.C. Ernst) and the carnivorous plant that becomes his meal ticket. Many of the songs stick to the doo-wop, girl-group stylings of the original film’s era, providing wonderful arrangements for the Greek-chorus-like trio of Crystal, Ronnette and Chiffon (Clotile Bonner, Ali Bennett and Kandyce Marie Gabrielsen). Lisa Ann Grow contributes a terrific performance and a dynamic voice as hard-luck heroine Audrey, who gets to belt out “Suddenly Seymour” and wistfully idealize Eisenhower-era suburbia in “Somewhere That’s Green.” And Ernst delivers charming work playing Seymour as a Zach Braff spin on Woody Allen. The cast provides big performances—no one more so than Marc Raymond, whose campy, Nicolas Cage-in-Wild at Heart take on sadistic dentist Orin Scrivello plays to the balcony of theaters somewhere in Nevada—and director Brent Schneider’s choreography works as well as it can within the confines of the available space. But the mobile set for Mushnik’s Flower Shop often seemed to be a genuine challenge for the actors to navigate. Props fell to the ground as they squeezed between set elements, and the hinged side panels swung perilously into actors trying to duck behind them. When the final, massive incarnation of Audrey II makes its appearance, it not only dominates the set—it becomes hard to comprehend how anyone is going to move anywhere. Kim Blackett’s Audrey II creations warrant additional mention, because they’re remarkably effective for low-tech props. Ernst offers some deft physical comedy with the hand-held version he manipulates, and the combination of puppeteer Jon Brady Copier and the booming voice of Jason Tatom make for an almost seamless pairing once the creature gets big enough to consume flesh. A whole lot of what makes Little Shop of Horrors fun comes from the pot-bound bundle of id, and the show never fails to maintain an energy level that brightens the black comedy. But it can become just a little bit harder to lose oneself in the fun when there’s a constant nagging fear that someone is going to trip and tear one of Audrey II’s vines, if not an anterior cruciate ligament. All credit to the performers for the gusto that washes out into the audience. Just think twice about reserving your seat in the front row, lest you find a little bit of Audrey II itself washing out into the audience as well.